* 1990~1993 : Chung Buk Sport High School Tae Kwon Do Sparring Team. * 1993~1996 : Yong-in University Tae Kwon Do Sparring Team. * 1995~1996 : Chung Buk Red Cross Captain of Life Guard. 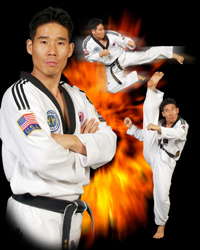 * Kukkiwon (World Tae Kwon Do Headquarters) 5th Degree Black Belt Tae Kwon Do. * Kukkiwon (World Tae Kwon Do Headquarters) Achieved Tae Kwon Do Master Degree. * Chung Buk Red Cross Chung Buk Red Cross Life Guard. * Chung Buk Red Cross Chung Buk Red Cross Swimming Instructor. * Civilization Athletic Association Achieved License Competition Instructor. * Civilization Athletic Association Living physical Education Tae Kwon Do Coach License. * Civilization Athletic Association Living physical Education Swimming Coach License.